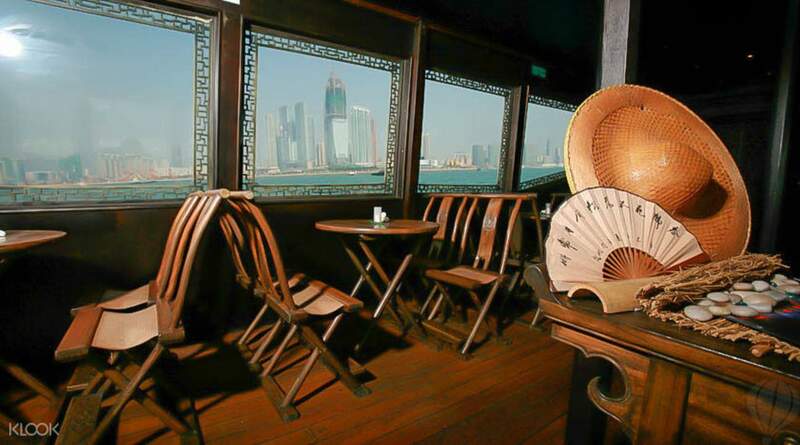 Try out more AquaLuna activities on Klook: AquaLuna Harbor Day Tour, AquaLuna Stanley Cruise, AquaLuna Dim Sum Cruise and AquaLuna Evening Sail! The show is great especially when boarding the cruise. 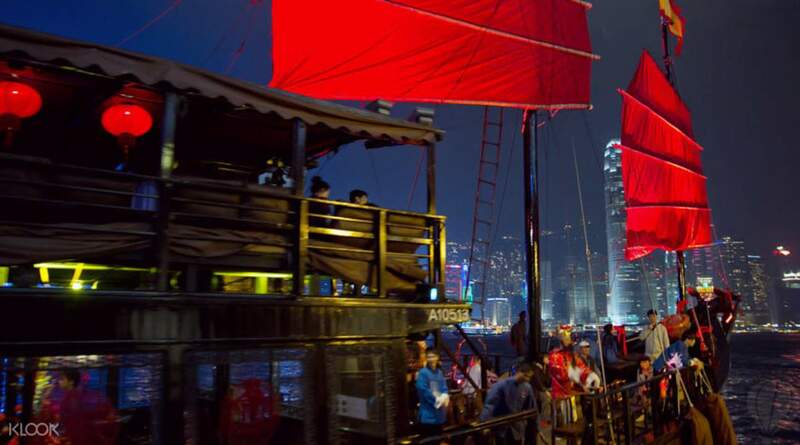 Experience Hong Kong's stunning skyline lit up by the famed Symphony of Lights show aboard one of the city's last remaining traditional red-sail Chinese junks - the AquaLuna! 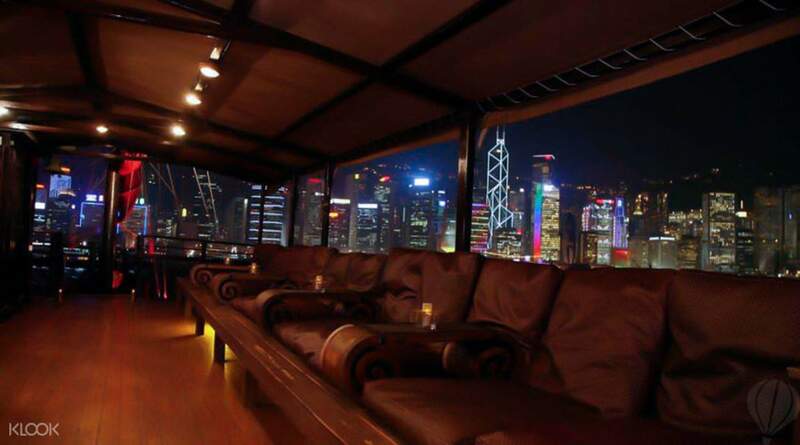 Relax in style on a comfy lounge bed, enjoy a complimentary drink and soak up the sights and sounds of Hong Kong's fantastic night scene. Hop aboard the iconic AquaLuna on her nightly Symphony of Lights Cruise, to experience the famed lights and sounds show – also the world's largest, permanent showcase of its kind. Recline on deck, sip a refreshing cocktail, and watch as laser lights beams leap around you. One of the top things to do in Hong Kong! Central Pier 9: via Hong Kong or Central MTR stations, follow signs for the ferry piers. You'll walk along a raised pedestrian walkway. Once you get to the end, turn right and keep walking until you come to Pier 9 (right next to the Observation Wheel). Great Experience. One of the best way to tour in hong kong.The boat is comportable and they also give you a drink of your choosing. The crew is very attentive to the guest needs. Superb Service. Its a nice experience circling around while watching the symphony of the lights. Great Experience. One of the best way to tour in hong kong.The boat is comportable and they also give you a drink of your choosing. The crew is very attentive to the guest needs. Superb Service. Its a nice experience circling around while watching the symphony of the lights. Great cruise! Beats queuing around with the throng of people at the kowloon harbour side. The lights show is amazing - this aqualuna trip is definitely worth doing to see the symphony of lights show in hongkong! Great cruise! Beats queuing around with the throng of people at the kowloon harbour side. 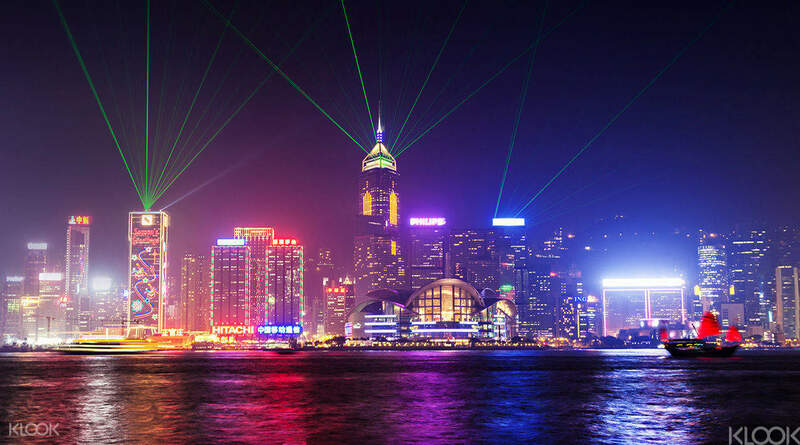 The lights show is amazing - this aqualuna trip is definitely worth doing to see the symphony of lights show in hongkong! An excellent trip to watch Symphony of light from the comfort of view from the sea. The cruise is good to have view of entire landscape. An excellent trip to watch Symphony of light from the comfort of view from the sea. The cruise is good to have view of entire landscape. Awesome way to experience Symphony of Lights! Nostalgic experience accompanied by a nice welcome drink on board. Awesome way to experience Symphony of Lights! Nostalgic experience accompanied by a nice welcome drink on board. Highly Recommend! The voucher was easy to use. They also served a round of drinks on board. Great experience with family. Will surely use Klook again. Highly Recommend! The voucher was easy to use. They also served a round of drinks on board. Great experience with family. Will surely use Klook again. A very pleasant experience (especially since the weather was nice), even if a bit pricey. I do believe that the Symphony of Lights adds to the experience (though, perhaps, not as much as it does to the price), so if you can afford it, I would go for it. Also, I would strongly recommend arriving at Tsim Sha Tsui (not at the pier near Central - really, if you board from there, you will definitely miss the better seats) some 45-60 minutes before the departure (and don't forget to register with the staff standing at the pier when you arrive), so as to get the better seats outside. A very pleasant experience (especially since the weather was nice), even if a bit pricey. I do believe that the Symphony of Lights adds to the experience (though, perhaps, not as much as it does to the price), so if you can afford it, I would go for it. Also, I would strongly recommend arriving at Tsim Sha Tsui (not at the pier near Central - really, if you board from there, you will definitely miss the better seats) some 45-60 minutes before the departure (and don't forget to register with the staff standing at the pier when you arrive), so as to get the better seats outside. A shame about the weather but overall it was good. The staff on the boat very helpful but the staff on shore not helpful at all. Make sure you get there about 30mins prior and find a staff member to mark your name off so you get a seat once onboard. The 10mins the experience advises is not nearly long enough as there is a long queue by then. A shame about the weather but overall it was good. The staff on the boat very helpful but the staff on shore not helpful at all. Make sure you get there about 30mins prior and find a staff member to mark your name off so you get a seat once onboard. The 10mins the experience advises is not nearly long enough as there is a long queue by then. It was a hassle free booking! Just booked and presents the booking and we’re off to go! Definitely a fun experience for me and my Sister! Will be more than Glad to have another round when back in Hong Kong again! It was a hassle free booking! Just booked and presents the booking and we’re off to go! Definitely a fun experience for me and my Sister! Will be more than Glad to have another round when back in Hong Kong again! Excellent excursion. Boat trip was amazing. Light show was a bit of a let down. But still an enjoyable trip. Excellent excursion. Boat trip was amazing. Light show was a bit of a let down. But still an enjoyable trip. Q: Can I get on at Tsim Sha Tsui and get off at Central? A: No. The ferry will depart and return to the same pier. However, you can easily take the very affordable Star Ferry across Victoria Harbour so you'll have no problem getting to either Central or Tsim Sha Tsui after your cruise.